Tove Jansson takes us on a beautifully illustrated and delightfully quirky journey through Moominvalley, perfectly capturing the experience and its emotional impact as seen through the innocent eyes of Susanna, who is bored with her life: Her cat is too content; her surroundings, too gentle. She craves adventure when there is none to be had. But when a new pair of glasses appears in front of her, she gets an opportunity to live the bold life that she has always longed for as her surroundings are transformed into a dark and sinister landscape. At first Susanna is afraid, but then her daring side takes over and she moves forward to an unknown destination, seeing some familiar faces along the way. Combating everything from an exploding volcano to a fierce winter storm, from mysterious monsters to stormy seas, Susanna and her newfound friends are given the adventure of a lifetime. With subtle existential themes, a lyrical rhythm, and delicate watercolor illustrations, The Dangerous Journey captures the curiosity of children and adults alike. 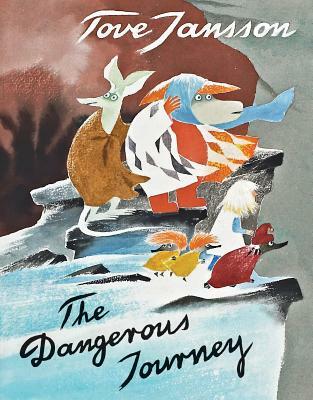 Published for the first time in North America, and the last picture book completed by the world-renowned Jansson, The Dangerous Journey pushes the emotions that underlie our nostalgia out into the open with an unparalleled viewpoint that always brings forth a new perspective. Take this fantastical journey to Moominvalley and never look back. Tove Jansson (1914–2001) was born in Helsinki and spent much of her life in Finland. She is the author of the Moomin books, including Comet in Moominland and Finn Family Moomintroll. Born into an artistic family—her father was a sculptor and her mother was a graphic designer and illustrator—Jansson studied at the University College of Arts, Crafts and Design in Stockholm, the Finnish Academy of Fine Arts, and L’École des Beaux-Arts in Paris. In addition to her Moomin books, she also wrote several novels, drew comic strips and worked as a painter and illustrator. In 1966, she was awarded the Hans Christian Andersen Medal for her body of work. Jansson had a studio in Helsinki but spent most of her time at her home on a small island called Klovharu.